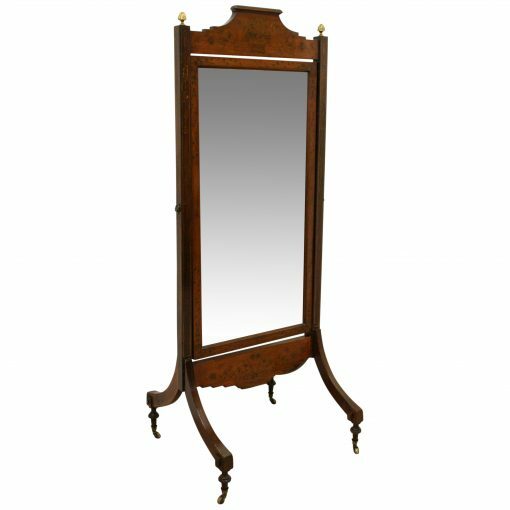 Circa 1890, Sheraton style mahogany and profusely inlaid free standing cheval mirror. At the top of the frame there is a simple pediment with an inlay basket of flowers. The mirror is held in place on the uprights by 2 brass axe head drops and topped by stylish cast brass finials. The facings of the mirror, the frame and the uprights are inlaid and the mirror is bevelled edged. Beneath the mirror there is a shaped cross stretcher to gives the mirror stability. The whole piece stands on 4 inlaid cabriole legs which finish with a stylish Greek key block left and right. There are turned feet beneath this finishing on raised brass cup and brass castors. The mirror is a neat size, clean, stylish.